Samsung Galaxy Note 3 is the latest and fully power-packed featured Smartphone introduced from Samsung in its Galaxy series devices so if you're using or thinking to bought yourself a new Galaxy Note 3 running Android 4.3 mobile operating system than you will be glad to heard that its now possible to Unlock, Flash and Root Galaxy Note 3 Running Android 4.3 Jelly Bean mobile OS. To gain full system-level access to the Linux kernel of Android 4.3 Jelly Bean operating system and to fully modify and customized the look and feel of Samsung Galaxy Note 3 device, the Flashing and Rooting of Android is must. So below you will find the step-by-step guide and tutorial on How to Flash and Root Google Android 4.3 Jelly Bean On Samsung Galaxy Note 3 Smartphone. Before following the steps first make sure to get full backup of your device in case you missed something and wants to restore back. So let's start the procedure. 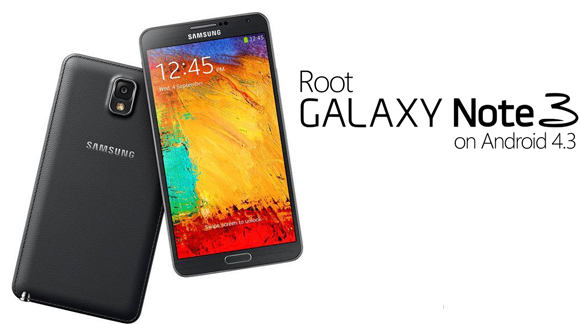 How to Flash and Root Galaxy Note 3 Running Android 4.3 Jelly Bean? Step 1: First, extract the downloaded package to get the .tar.md5 file, and save it to your desktop of Computer/Laptop. Step 2: Now, Reboot Galaxy Note 3 into Download Mode by pressing and holding Volume Down and Home keys whilst powering on the phone. Step 3: After that, Launch and Run Odin3 on your PC/Laptop and connect your Galaxy Note 3 using USB cable. Wait for Odin to detect the device (You must able to see a COM value in the first box and an Added message in the box below). Step 4: Now, Click on PDA and select the extracted .tar.md5 file for your device. Make sure Repartition is unchecked, and Auto-Reboot is checked (Nothing; except Auto-Reboot must be checked). Step 5: Click the Start button and wait for Odin3 to finish flashing the PDA. The phone will reboot as the process completes. You're done; Now Reboot device and you will have root access on your Galaxy Note 3 running Android 4.3. Congratulations! !